Experts agree that "human factor" caused the crash of Russia's civilian airliner Sukhoi Superjet 100 in Indonesia. This indicates that the image of the Russian aviation hasn't been seriously affected. Yet the rivalry from the Brazilian Embraer-190 poses new challenges. The finalized investigation into the May 9 air disaster involving a Russian-made Sukhoi Superjet 100 confirmed what Russian aircraft builders had been saying all along: No technical failures occurred during the flight. This civilian airliner remains the main hope for Russian aircraft builders; with this model, the United Aircraft Company (UAC) is planning to take up to 10 percent of the regional market share by 2025. Only strong rivals, such as the Brazilian Embraer-190, can stand in its way. Official results of an inquiry into the crash of the new Russian civilian airliner Sukhoi Superjet 100 (SSJ) that killed 45 people – 34 Indonesians, eight Russians, and one person each from France and the United States – were released in December. Indonesian and Russian experts have agreed that the notorious “human factor” was to blame for the tragic accident and that the aircraft's technical systems had warned pilots and air traffic controllers that there was a problem with the flight. Data extracted from the SSJ’s flight recorders found at the crash site showed that the terrain awareness and warning system (TAWS) clearly advised the pilots to ascend 24 seconds before the plane crashed into Mount Salak. However, the Sukhoi Corporation’s seasoned test pilot, Aleksandr Yablontsev – distracted by a conversation in the cabin with potential buyers of the plane – decided to rely on the professionalism of an Indonesian air traffic controller and dismissed the automatic alerts. Convinced that he was heading toward a plain, the pilot simply switched the system off. Furthermore, the controller mistakenly registered the new Russian civilian aircraft as a military fighter jet in the airport’s tracking system: A floating prompt used the first two letters “SU” to identify it as a Sukhoi-30 fighter jet of Indonesia’s Air Force. Military flights that do not require heightened attention from civilian controllers are not infrequent in the Halim Airport area, so the controller allowed the plane to descend to a risky altitude of 6,000 feet. He only noticed that its mark was missing from the radar screen 17 minutes after the crash. UAC and Sukhoi representatives refused to believe in a technical malfunction from the start: the plane had performed around 500 successful test flights, spending more than 800 hours in the air. The Mexican company Interjet did not withdraw its order either. At the Farnborough show in July, Interjet executed an option for the purchase of five more SSJs, in addition to the 15 it ordered in January 2011. In the fall, the company signed a letter of intention to buy 10 more planes. Aeroflot has been successfully using 10 aircrafts of this type to carry passengers, and the Yakutia airline received its first SSJ delivery in December. Sukhoi Civil Aircraft has signed contracts and options for 31 SSJs since the Indonesian crash, so the damage to the model’s reputation has been minimal. Meanwhile, the Russian plane faces new market challenges. In mid-December the Interstate Aviation Committee (IAC), which oversees certification of aircraft in Russia and a number of CIS countries, held a special ceremony to award a category certificate to Brazil’s aerospace outfit Embraer for its E-190 and Е-195 regional models. This means that a direct rival to the SSJ-100 has arrived on the Russian market. The base E-Jet model, like the Russian plane, can carry 98 passengers for up to 2,600 miles, has jet engines, and is manned by a crew of two pilots. According to the IAC, SSJ’s Canadian rival, Bombardier, has also applied for certification for its CRJ-900 and CRJ-1000 jets. Industry analysts and market players believe that it took so many years for those foreign models to become certified, only because Russian aircraft builders had their own model in development for this class. They also believe that allowing SSJ’s foreign peers into its “domestic” market would intensify competition for Russian airlines amongst aircraft manufacturers. The Canadians and the Brazilians have the advantage of huge experience operating hundreds of their planes worldwide. The Russian model’s key strengths include a low purchase price and low operating costs. According to UAC’s data, the SSJ-100 is significantly less expensive, even though its operating efficiency is 8 percent higher than the similarly equipped E-190s. 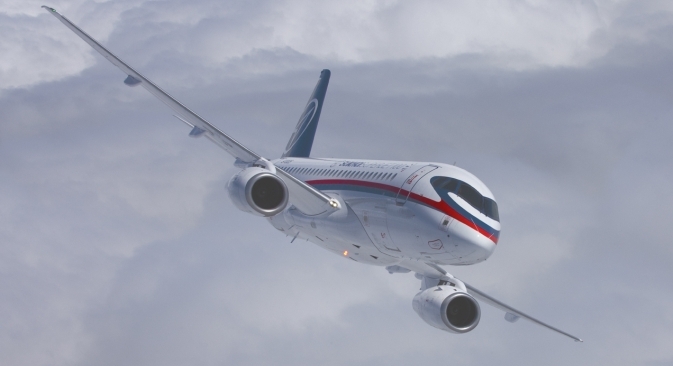 The Corporation added that, with the exception of S7, all large and solvent Russian airlines have already placed orders for the SSJ-100, for a total of 98 units. Market sources pointed out that, even in the absence of an IAC certificate, CIS countries have already been operating SSJ’s foreign peers; with nine orders, Kazakhstan’s Air Astana is the biggest customer for the Brazilian E-190. Cost of aircraft operation is one of the most important factors airlines consider when upgrading their fleets, said Oleg Panteleev, chief analyst of the Aviaport agency. “Additionally, unlike the SSJ, the Brazilian planes lack maintenance and repair infrastructure in Russia, and there is not a single pilot training simulator here,” Panteleev said, adding that far from all Russian regional airports were able to accommodate and service this type of plane. Thus, airlines that decide to back the Embraer in Russia by buying the Brazilian planes will have to go through all the trouble of being trailblazers. Even so, Russian aircraft manufacturers have yet to fulfill their ambitious plans to increase output of the SSJ from the current 12 planes a year to the goal of 60. Aleksey Ekimovsky is the author for the market guide “Russian Transport”.